Howard Miller learned the craft of clockmaking from Old-World masters who plied their special trade in Germany’s Black Forest region. 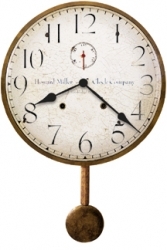 When he returned in 1926 to establish his own company in the town of Zeeland, Michigan, his first order of business was to create a clock that honored the past — and focused on the future. This Moment in Time clock is authentic to the first timepieces that Howard Miller produced.